Receive $250 off your roofing project! 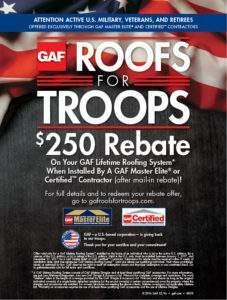 GAF has announced the continuation of the Roofs For Troops Rebate Program. GAF recognizes the sacrifice that the military and their families make and we are proud to partner with GAF in offering this program. If you are a veteran or retiree or know of someone in the military, please pass this rebate along to them! Mark's Custom Exteriors is a proud supporter of those who have served and want to pass along this thank you! You will receive a $250 rebate from GAF on any complete GAF Lifetime Roofing System. To find out more, give us a call at 503-397-2215, text us at 503-396-2773, or fill out the consultation request form!